Playing with Electrons to Make Stories: Ana-Kata Relics / Using 4D geometry for fun and profit. Ana-Kata Relics / Using 4D geometry for fun and profit. This item is based off of extra-dimensional spatial geometry, the focus of the item being the use of the 4th dimension to circumnavigate the laws of our normal 3. The 4th dimension involved in this item is not the concept of time commonly associated with the term, rather it is a plane that exists 90 degrees from the other 3 planes. Being able to access 4 dimensional space grants a person a number of abilities that would appear miraculous from the perspective of someone residing in the standard 3, however, these abilities would be based on purely physical phenomena. After the back story for the item, there will be an explanation of the some of the math and concepts behind the item, and how it allows for the crazy things someone can do with it. Sidestep: The primary, and most easily used, ability of the item is to allow an individual to circumnavigate objects/individuals/obstacles in 3 dimensional space through the simple act of walking. When the character wishes to circumnavigate the 3rd dimension, they may side step into the 4th dimension (moving ana), move in a straight line to their intended destination, then move back into the 3rd dimension (moving kata). This allows the character to avoid everything that would normally be in their way. Optional Rules: Depending on the game, this Sidestep could be too powerful without drawbacks. These drawbacks are intended to balance out the ability, choose the drawback(s) that best suit your game, or go without them entirely. A very mild example of the sights that can be seen. Some things cannot be unseen: While in this space, it is a very unhealthy to keep one's eyes open, there are vistas and beings in this 4th dimension that can break the mind if seen. The character must run with their eyes closed in order not to go insane, to simulate this 'running blind' the character must roll beneath their Wisdom score on 1D20. If they fail their roll, they pop out in one of the squares adjacent to their intended target, use 1D8 and count the sides and corners of the square starting with whichever side faces north. If the square is occupied by a living being, both the character and the being take 5D6 damage, if the character encounters a square occupied by a solid object, both the object and the character take 10D6 damage. A character that moves with their eyes open does not need to make a roll, to reach their intended destination, but they must roll beneath their Wisdom with a -5 penalty or lose their mind in some way. There are a number of mental illnesses in various gaming products to torture the character with. Alternatively, the character may drug themselves, preferably with something that makes the mind more flexible and less prone to 'freak-outs', while under the effects of the drug they need not worry about closing their eyes or going insane. The shortest distance between two points: Moving in this way would be less efficient than moving in the 3rd dimension because the character needs to expend extra movement to step into the 4th dimension and then back out again. Using the 5 ft. range increment system, the character would have to take a 5 foot step into and back out again of the 4th dimension, reducing the space they can travel by 10 feet. The GM may require more than just 5 foot steps, maybe the barrier between the 3rd and 4th dimension slows movement, or movement in this 4th dimension requires extra effort due to different laws of motion. In any case, feel free to adjust the movement penalties/expenditures as fits the game or the situation. Hyper Perspective: The character is able to perfectly see beyond the boundaries of 3 dimensional space. This ability grants the character a kind of x-ray vision, being able to see beyond obstacles, however this vision is just a natural consequence of the added perspective that seeing in 4 dimensions allows. The character is still able to see obstacles, however, they see around the obstacles as far as the character is normally able to see taking into account lighting conditions. Optional Rules: Depending on the game, this Hyper Perspective could be too powerful without drawbacks. These drawbacks are intended to balance out the ability, choose the drawback(s) that best suit your game, or go without them entirely. Some things still can't be unseen: The world of the 4th dimension is full of things and sights that can drive an individual insane. When a character peers through the 4th dimensional perspective, they must roll beneath their Wisdom with a -5 penalty or lose their mind in some way. There are a number of mental illnesses in various gaming products to torture the character with. Alternatively, the character may drug themselves, preferably with something that makes the mind more flexible and less prone to 'freak-outs', while under the effects of the drug they need not worry about going insane. So many distractions: Seeing the world through a 4th dimensional perspective can be dizzying as well as confusing. 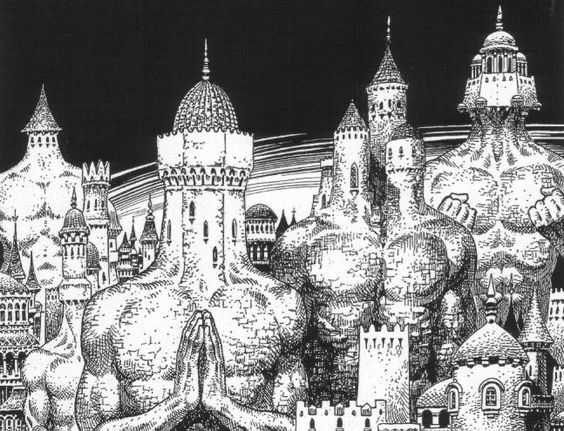 When a character attempts to see beyond the boundaries of the normal world, they must make a Search check or roll beneath their Wisdom on 1D20. If a character fails their roll, they are unable to find the spot the place beyond the boundary they wish to see. A character must wait a period of time (up to the GM) to reorient themselves before attempting another roll. - Automatic critical damage, if a natural 20 is rolled then the damage is quadrupled. - Maximum damage is caused without needing to roll, double the damage in the instance of a roll of 20. - Provide a multiplier to damage depending on the area struck (2x for Chest Cavity or 3x for Head). If the character is a Rogue/Specialist, increase their backstab multiplier by +1x. Wrenching Force: When pulling something out of a container into a 4th dimensional space, and back into 'normal' space, can cause the object to be warped or twisted reducing their utility or value. When attacking a piece of an object or an internal part of a creature can cause broken bones (1D4 Damage) if attacking unarmed, or causing the weapon to become seriously warped causing a to-hit and damage penalty of -4. 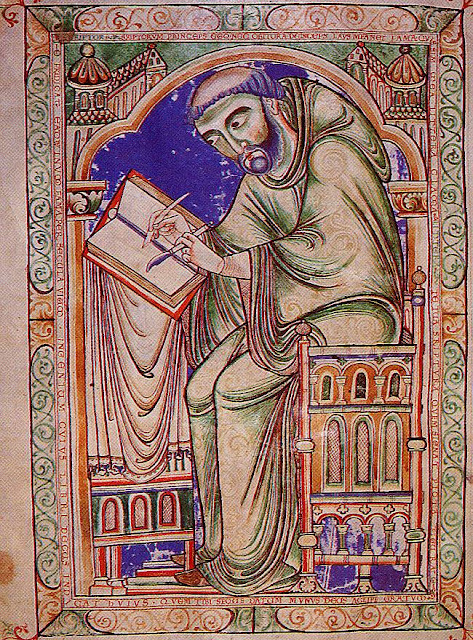 A medieval portrait of a Pythagoras monk. Obsessed with discovering divinity found within the fields of mathematics and geometry, these monks devoted themselves to the teachings of an ancient mathematician named Pythagoras. Many, but not all, of the works of Pythagoras were preserved for modern eras through the painstaking reproductions the monks made of the disintegrating texts by Pythagoras they acquired. What few texts that were reproduced sparingly formed the heart of their strange theology about their god. According to these secret texts transcendent beings exist between the spaces of the world, in a direction that cannot be reached without certain rituals or tools of enlightenment. At the height of their craft the monks learned to create relics or keys to access these hidden spaces using certain formulas and rituals to bend space around the object and create 'soft spots' in the world that a person might slip through. The most powerful of these relics could open portals to allow multiple people to enter and exit the extra-dimensional realm. A prime example of these high powered relics belonged to a king named Alexander who banished the giants Gog and Magog into a space where they posed no threat to the world. Texts written about these relics made by the monks warn against using these items in certain localities of the world lest they let out things that have been imprisoned in the hidden parts of those spaces. For nearly three centuries the work of these monks remained secret, or was ignored, by their mother church. Once their strange beliefs and practices were discovered an inquisitor was sent to determine the level of heresy the order had committed. Upon his arrival the inquisitor found the monk's abbey abandoned without sign of its inhabitants save for bits of teeth, hair, and blood near tiny non-euclidean shaped holes found throughout the abbey. The heretical texts the monks had produced, along with many of their relics, were put to the flame, though many of the objects escaped destruction. These objects can rarely be found in the tombs of kings and the reliquaries of forgotten churches. Early examples of the monks' work. The objects created by the monks would commonly be called 'impossible' due to the objects violating physics and perspective due to their shapes. 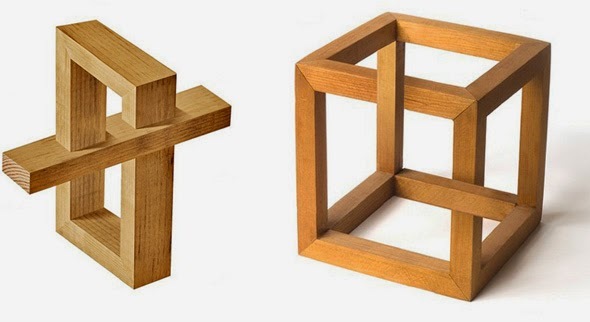 Normally, shapes such as these could not normally created without tricks of perspective, however, these objects achieve impossible shapes without such trickery which can cause vertigo in some who stare at the objects too long. These relics generally are can fit in the palm of an adult, and weight but a few pounds. Understanding 4 dimensional geometry can be incredibly difficult without a strong background in higher level mathematics. The best way to understand the 4th dimension is to use our understanding of the relative differences between the 2nd and 3rd dimension and apply those concepts to the 4th dimension. In the case of the item, we need only be concerned with the relative capabilities brought with being able to act 4 dimensionally. Take the figure of a dot in a circle. Movement: If a 2D being wished to enter into the circle, they would need some kind of break in the circle. Without the ability to move 'up' and over the line of the circle, the 2D being is completely cut off from the dot. 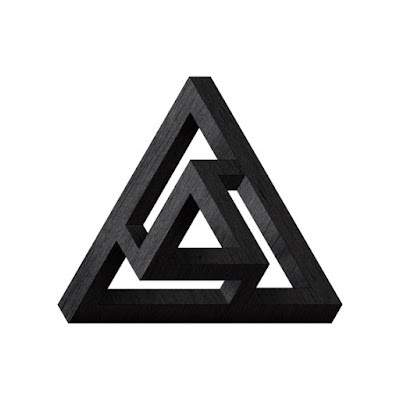 This would be similar to a 3D being encountering an infinitely tall wall surrounding an object, there is no way for that being to circumvent the barrier. However, a 3D being would be able to easily solve the problem encountered by the 2D being by simply stepping 'up' and 'over' the line into the circle. A 4D being would easily be able to enter a completely enclosed 3D space without having to interact with the barrier, much like a 3D person stepping up and over a 2D barrier. Sight:The 2D being would not be able to see the dot within the circle due to the line of circle interrupting the 2D viewer's line of sight. This inability to see the dot could be likened to a 3D viewer being blocked by the infinitely tall circular wall from the first example. Without the 3rd dimension to use to travel 'up', the 2D viewer is completely incapable of ever seeing the dot. 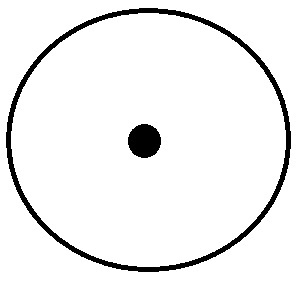 Since we are gifted with the ability to perceive 'up' or 'out', we can easily see the dot. This ability would be similar to a 4D viewer looking at a 3D object. The 4D viewer would be able to see the contents of any 3D object as well as the exterior all at once just by looking. Interaction: The 2D being also would not be able to ever interact with, or grab, the dot at the center of the circle. A line of a circle would be completely impassible to a 2D being, making the contents of the circle off limits to the 2D being. However, for a 3D being it is a simple matter of reaching down and grabbing or moving the dot, the only effort expended being the act of reaching down to touch the dot. A 4D being would find it just as easy to reach past the boundaries of a 3D object to reach inside. This allows for the unsettling possibility of a 4D being reaching out and removing the organs of a person without breaching the skin. While this is a simplified version of four dimensionality, it should give you an idea of how the mechanics of four dimensional physical interaction should work. As with my previous posts, if my math or reasoning is off, please let me know.